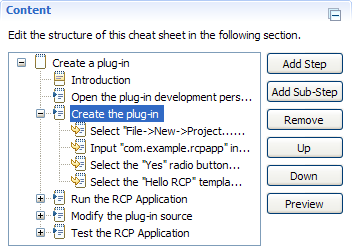 This section is accessible by selecting a step or sub-step node in the Content section. Command Combo Box Workbench Command Select a recently added workbench command from this field to add a command to a step or sub-step. Select <none> to remove a command from a step or sub-step. Note: A command cannot be added to a step that contains sub-steps. This field is globally populated and synchronized with all commands recently added to all steps and sub-steps. Parameters Table Workbench Command Parameters This non-editable field shows the applicable parameters for a workbench command selected in the Command combo box. Each row represents one command parameter or key-value pair. The first column lists command parameter keys and the second column lists command parameter values. Browse... Button Browse Workbench Commands Click this button to launch the Command Composer Dialog. 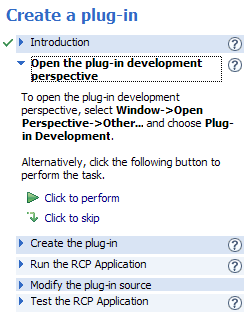 This dialog allows you to browse, test and select new executable workbench commands to add to a step or sub-step. The dialog also allows you to edit applicable parameters for selected workbench commands.